Friday 12th October: 5.00 pm - 8.00 pm. Saturday 13th October: 8.30 am - 5.30 pm. You can pick up your number yourself from the "number string" if you know your running number (list will be updated here before the race). If you can´t find your name on the list, ask help from the staff at the race office. Late registration is possible at the race office, on Saturday from 8.30 am. Late entrants and those changing their distance shall fill their information onto a separate form before the post-registration. Note! Late registration on race day is charged according to the late entry price. The race office is located in Tikkurila Sports Park in Trio Sport Center, (Tikkurilan urheilutalo). Address: Läntinen Valkoisenlähteentie 52-54, 01300 Vantaa. From the race office you can pick up your running number (see also Pick-up of running numbers). There are also e.g. equipment vendors. The start and finish are located in Tikkurila Sports Park in front of the race office (Trio Sport Center). Check out the competition center map. Parking space is limited in the area. Parking spots are reserved for runners in Tikkurila Sports Park. Public parking areas further away can be found at the Tikkurila train station or Tikkurila market square. The distance from the train station is approximately 1.2 km. See the map of parking areas. Changing rooms are located on the ground floor of Tikkurila Trio Sport Center. Showers for men also available in Hotel Tikkurila in the same building. A supervised and free kit storage area is available in the Trio Sport Center next to the race office. Time limit for the year 2018 marathon is 6 hours. Timekeeping and result service is handled by Result Service Finland Oy and T: mi Kokkens. RFID-based electronic timing sensors are used. Times are available for both net time (from crossing of the start line to the finish) and gross time (from the signal of the start pistol to the finish). The timing chip is attached to the race number. You must keep your race number in sight during the whole race. The race number must not be covered at any time during the race. The race number or RFID sensor does not need to be returned to the organizers. Inquiries related to the results: tulos.palaute@gmail.com tai 0400-550 801. There will be three refreshment stations at every round (approx. 10 km), (3,5 km Niittytie; 7,0 km Angervotie ja 10,5 km race center). Available will be Squeezy Energy Drink orange sports drink, water, pickle and banana. Refreshment station after the finish line will also serve Squeezy recovery bar, bread, cheese and yogurt. At the end of every round (approx. 10 km), 200 m before the refreshment station number 3, there will be Squeezy Energy gels available (one gel per person per round). If desired, you must bring your own drinks to the race office no later than 1 hour before the start. Bottles must be properly marked. At every refreshment station the drinks are in the following order: own drinks – sports drinks – water. After the race, we intend to serve coffee and buns to all participants in the lobby of the race office. Toilets are located in all service points as well as the start and finish area. Further toilets are available in the Trio Sport Center upstairs and downstairs in the changing rooms. Marathon: 3:00h, 3:30h and 3:45h, 4:05h and 4:15h and 1/2-maraton: 1:40h, 1:50h, 2:00h and 2:15h. You will find the pacemakers in the start area wearing Vantaa Marathon t-shirts with aimed time at the back of the shirt. Everyone crossing the finish line will receive a Vantaa Marathon medal, also every member of a relay team. In all categories, the top three runners will be awarded prizes. A prize ceremony will be held at the race office starting at 14.30. There are plenty of raffle prizes for pre-registered runners. The draw will be done during the run, and prizes can be picked up by showing the race number. There are partner retail outlets at the race office. There is massage available at the race office before and after the race by Rela-hierojat. Participation cannot be canceled or transferred to another person, and no entry fees are refunded. In case of sickness it is possible to transfer the participation to the next year. A medical certificate must be submitted in advance, or immediately after the race (during the next week). Transfer to the following year is possible once. In case of sickness please contact the organizers. Each participant participates at their own risk and is responsible for their own insurance. The organizers have free use of Vantaa Marathon photos. The First Aid is located in front of the Trio Sport Center. If you have to interrupt the race, please register to the nearest race official. If necessary, transportation is organized from the nearest refreshment station to the race center. Please report interruption also to the race office or to the info center outside the Trio Sport Center. People, who are not involved in the competition as competitors, are not allowed to assist runners in any way, for example, running or riding bicycle in front of the runners. If this kind of behavior is observed, the organizers have the right to disqualify the runner from the competition. The official Vantaa Marathon hotel is Original Sokos Hotel Vantaa. The hotel is situated within walking distance from the race venue and they have special offers for the runners. Hotel sauna available for those who are staying at Original Sokos Hotel Vantaa. Check the opening times from the hotel. 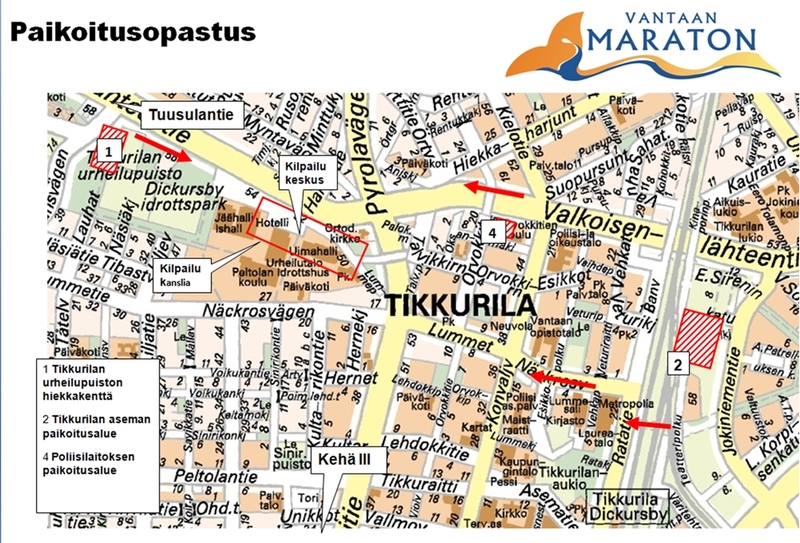 Vantaa Marathon after party at Original Sokos Hotel Vantaa in Pub Hertas at 8.00 p.m.